Main Street in downtown Lenoir. Lenoir is a city in Caldwell County, North Carolina, United States. The population was 16,793 at the 2000 census. It is the county seat of Caldwell County. Lenoir is located in the Blue Ridge foothills. The city also contains the Brushy Mountains, a spur of the Blue Ridge Mountains. Hibriten Mountain, located within the city limits of Lenoir, marks the western end of the Brushy Mountains range. The city was named for Revolutionary War figure and early North Carolina statesman General William Lenoir, who lived nearby. His restored home is a tourist attraction. 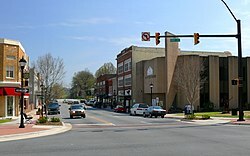 Lenoir is one of the principal cities in the Hickory-Lenoir-Morganton, NC Metropolitan Statistical Area. Lenoir was one of the recipients of the 2008 All-America City Award. The Broyhill Furniture company, one of the largest furniture companies in the United States and part of Furniture Brands International, has its headquarters in Lenoir and has historically been one of the town's largest employers. The Bernhardt and Fairfield furniture companies are also located in Lenoir. However, in the 1990s, these companies began outsourcing some work overseas, and they have closed several of Lenoir's furniture factories and laid off workers. Now the medical and education sectors are the largest employers in the area. Shuford Mills, one of the most respected names in the textile industry, Shuford Mill’s was founded in 1880 giving the company a presence in different centuries. Shuford Mills has a well earned and established reputation for quality woven products, exceptional service and commitment to the outdoor markets to which it serves. Google, Inc. has a server farm, or "data center," located in Lenoir. There was controversy over the nature, amount, and potential benefits of economic development incentives that the City of Lenoir, Caldwell County and the State of North Carolina gave Google in 2007 to induce the company to build the server farm. Lenoir is located at 35°54′30″N 81°31′48″W﻿ / ﻿35.90833, -81.53 (35.908438, -81.530012). According to the United States Census Bureau, the city has a total area of 16.6 square miles (42.9 km²), all of it land. As of the census of 2000, there were 16,793 people, 6,913 households, and 4,569 families residing in the city. The population density was 1,013.7 people per square mile (391.3/km²). There were 7,461 housing units at an average density of 450.4 per square mile (173.9/km²). The racial makeup of the city was 80.88% White, 14.71% African American, 0.23% Native American, 0.67% Asian, 0.11% Pacific Islander, 2.27% from other races, and 1.13% from two or more races. Hispanic or Latino of any race were 4.25% of the population. There were 6,913 households out of which 27.4% had children under the age of 18 living with them, 47.0% were married couples living together, 14.8% had a female householder with no husband present, and 33.9% were non-families. 29.7% of all households were made up of individuals and 13.1% had someone living alone who was 65 years of age or older. The average household size was 2.34 and the average family size was 2.87. In the city the population was spread out with 22.9% under the age of 18, 8.1% from 18 to 24, 27.5% from 25 to 44, 23.3% from 45 to 64, and 18.3% who were 65 years of age or older. The median age was 39 years. For every 100 females there were 91.1 males. For every 100 females age 18 and over, there were 88.2 males. The median income for a household in the city was $29,369, and the median income for a family was $37,280. Males had a median income of $26,122 versus $21,895 for females. The per capita income for the city was $16,697. About 10.4% of families and 14.3% of the population were below the poverty line, including 20.4% of those under age 18 and 12.7% of those age 65 or over. Kicks 103.3, local radio station. WJRI, News Talk 1340, local radio station. WKGX, AM 1080, local radio station. News-Topic, local newspaper in Lenoir/Caldwell County. The Presbyterian Layman, a publication of the Presbyterian Lay Committee independent of the denomination, is published in Lenoir. <center>Confederate memorial in the Lenoir town square. James T. Broyhill, Heir to the Broyhill family fortune; United States Congressman from North Carolina from 1962 to 1986 and a United States Senator from July 1986 to November 1986. Jan Karon, New York Times-bestselling author of the Mitford Series and the Father Tim novels (born in Lenoir). Kary Banks Mullis, Ph.D., American biochemist and Nobel laureate. Parker T. Williamson, minister and author. Five Major League Baseball players were born or have been residents in Lenoir: Johnny Allen (born 1904), Lindsay Deal (born 1911), Charlie Cozart (born 1919), Rube Walker (born 1926), and Madison Bumgarner (born 1989). Hibriten High School: a 3-A school located in Lenoir, known for its superior athletic squads, drama team and music programs (see Hibriten High School Band) and exceptional academics. This page uses content from the English language Wikipedia. The original content was at Lenoir, North Carolina. The list of authors can be seen in the page history. As with this Familypedia wiki, the content of Wikipedia is available under the Creative Commons License.